Former FBI special agent Ali Soufan dissects bin Laden’s brand of jihadi terrorism and its major offshoots. ...revealing and timely book ... Soufan writes with immense knowledge and authority. He was the lead investigator of the bombing of the American destroyer Cole and a supervisor of counterterrorism operations and the investigation of events surrounding Sept. 11 ... Soufan brings firsthand, on-the-ground experience hunting down and interrogating Qaeda members. 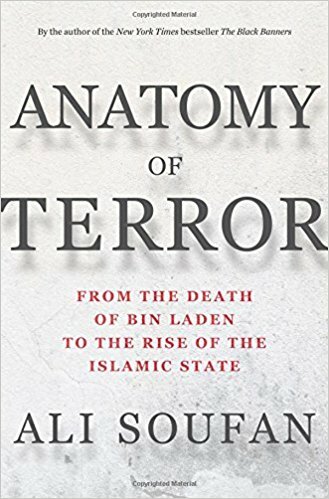 Anatomy of Terror not only tells a gripping story but is filled with insights that put today’s terror attacks by the Islamic State and Al Qaeda in perspective with the history and complicated geopolitics of the region. Mr Soufan is at his most interesting in describing in detail the ambiguous role of Iran in the arrest, and then the release, of senior al-Qaeda figures fleeing Afghanistan—including Hamza bin Laden, Osama’s son—to be used 'either as leverage or as attack dogs' ... His recommendations are mostly generalities about fighting jihadism with 'an entirely new narrative,' but he makes one particularly sensible point: the West should make better use of rehabilitated former jihadists for ideological counter-propaganda. One reason that [the] book [doesn't] entirely satisf[y] is that the struggle against jihadism may be too current, too diffuse and in parts too inaccessible to write about fully. ... a valuable guide to the story so far and offers some predictions about what the next chapter may look like, after the Islamic State is forced back into a mere insurgency ... Despite its subtitle, Soufan retells the Qaeda story from the beginning, enriching that now oft-told tale with newer materials, including some from the trove of communications seized in the 2011 raid on Osama bin Laden’s compound. His approach is to explain the movement through the eyes of a few key terrorist figures ... the best and most interesting parts of Soufan’s book center on a less famous figure: Saif al-Adel, a pragmatic Egyptian ex-soldier who devoted his professional life to the post-Cold War global Sunni Islamist movement and played a secondary role, Zelig-like, in most of the important events in Qaeda’s history ... Soufan offers lucid explanations of a worldview that to casual Western eyes may seem mindlessly nihilistic, but is coherent within its own terms of seeking to establish a caliphate. What did you think of Anatomy of Terror: From the Death of bin Laden to the Rise of the Islamic State?